Insurance coverage for those unexpected moments! One major difference between buying a new vehicle versus a good used vehicle is the . . . . . Warranty! Why buy a warranty on a used car? Would you purchase a new vehicle from a manufacturer who didn’t offer you a warranty on that new car? Likely not, so why purchase a used car which might eventually need some repairs? Why not purchase a warranty program to provide piece of mind to you as the vehicle ages? AJS Auto Sales offers warranty products from several nationally recognized and insured warranty companies. We are among the best companies in the Toronto and Scarborough area at providing a waranty service for our customers. Home of the 90-day vehicle exchange guarantee*!! At AJS, it is all about you the customer. ⦁ How long do I intend to keep this vehicle? ⦁ How many kilometers do I drive per year? ⦁ Do I drive my vehicles hard? ⦁ Protective warranties for the vehicle (i.e. Tire/Road Hazzard/Key Fob/Interior/Paint). Typically, a warranty will cover essential powertrain components of your car like the engine, transmission, differential transfer case, turbo/superchargers, etc. This would be a limited basic powertrain warranty program. One can imagine, your vehicle consists of many other components that could breakdown over time. For instance, issues can arise with the steering, suspension, air conditioning components to name a few. There are many supplementary mechanical parts that are not covered with a limited basic warranty. Most modern vehicles today have many electrical components and are often driven by computer software. A total comprehensive coverage warranty provides peace of mind that will ensure you as the customer don’t have to worry if a braking component has failed. Our total warranty coverage programs encompass the entire vehicle other than normal maintenance components like brake pads, rotors, lights, wipers, etc. but we can help with those too! Most independent car dealers won’t inform you that your limited warranty program will not cover repairs whose root cause was from non-lubricated components. For instance, if a seal fails which causes a pump to fail, then a warranty program without seals and gaskets coverage will not reimburse for either part or the repairs. With the seals and gaskets coverage, the warranty will cover both the new seal, new pump and the repairs required. At AJS, we won’t sell you a warranty program without seals and gaskets coverage. It’s the right thing to do and it will ensure your happiness down the road. As with every insurance type of product, warranty is one type of insurance product, there are deductibles. They range from $0 to $500. In many cases, with a one-time upfront fee at time of purchase, you can reduce the deductible to zero. Choosing the correct deductible amount is customer specific and dependent. AJS does not recommend one amount over another. Note: Fluids and shop supplies are ALWAYS additional costs regardless of the deductible amount selected. All aftermarket warranty companies have the same policy. All the warranty providers have limits per claim on their products. This limits the providers’ exposure on specific incidents. They can range from $1000 to $5000 depending on the product you choose. AJS recommends that you always select a limit that is conservative and safe for most major repairs. AJS recommends anything between $2500 to $4000 as a good starting point. Regardless of how you plan to keep your vehicle, having a warranty program is tantamount to an insurance policy protecting you from having you pay out your hard-earned income towards repairs. Often customers choose shorter terms but in reality, the marginal cost to take a one-year warranty to a three or four-year program, is nominal in the big scheme of things. Our partners offer one-month terms to seven-year terms on their warranty products. AJS doesn’t recommend any specific term as this feature is highly dependent on the customer’s preference. If you drive your vehicle extensively, picking a mileage limit on your warranty program is key. It is prudent that the mileage limit should be appropriate with the age of your vehicle, your usage and coincide with the duration of your warranty. Although AJS doesn’t recommend any specific mileage limit when you choose your warranty product, we will discuss with you, which program is best suited for you. Warranty products that cover tires and rims, lost key fobs, rips or tears or dents are a must in today’s world. With the condition of the roads we encounter, it is very easy to dent/warp a rim, get a flat tire or cause curb damage/rash on a rim. Accidently a child could rip or tear one of your seats or you could even lose your key fob for your vehicle. Did you know that even modern vehicle keys (not a FOB), have chips inside them to pair a key to a particular vehicle? These are anti-theft and immobilization mechanisms from the manufacturers. Since it is prudent to insure the mechanical components of your vehicle, why not protect the rest of your investment with a protection warranty? AJS offers a series of comprehensive protection warranties that will safeguard your investment from any accident, loss or pot hole! Even if you don’t buy a vehicle from us, we can even protect you and your existing vehicle with a warranty. Ask us how!! Global, in conjunction with AJS Auto Sales, have a unique 90-day vehicle exchange program. The consumer purchases one of these warranties and up to 90 days, has the right under the warranty to return the vehicle – no questions asked, so long as they choose another vehicle for the same or greater purchase price or they have not made a claim on the warranty up until they turn the vehicle in. Come in and ask one of our representatives about this unique exclusive program! With Global warranties, seals and gaskets coverage applies to all seals and gaskets (not just lubricated components buy include seals/gaskets that contain or allow for the passage of air (i.e. air intake and exhaust manifold, etc.) Global is the only company to offer warranty protection programs that cover curb damage or cosmetic protection of rims. Global is also unique in that their basic warranty program includes water pump, starter/solenoid and alternator/regulator. Lubrico is Canada’s oldest (established in 1977) aftermarket warranty company. Lubrico has been in business for over 40 years with over 185 million in claims paid to date. Purchasers of their products should rest assured they are fully insured through Northbridge General Insurance. Lubrico also has a unique program that allows their customers to double their warranty term for a nominal fee if they have been claims free up until that point. If you have not purchased a vehicle from AJS Auto Sales, Lubrico offers a warranty program you can place on any vehicle. Assurant has the most unlimited kilometer plans and on average the lowest deductible plans in the industry. In addition, you can service your vehicle at any manufacturers dealership or licensed repair facility of your choice in Canada or USA. They will pay the repair facility or dealership’s posted labor rate which is unique in the industry. 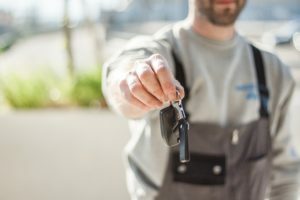 If you purchase an Assurant warranty from AJS and your new pre-owned vehicle still has a manufacturer’s warranty, consumers are able to defer the Assurant warranty to begin after the manufacturer’s original warranty expires. Assurant’s warranties cover Hybrid Electric components. This is a unique feature of Assurant’s, unlike any other warranty company in the industry.